Whether they died from natural causes or as sacrificial offerings, the residents of America’s largest prehistoric city were surprisingly diverse, with at least a third of the population having come from communities up to hundreds of kilometers away, according to new research of the settlement’s ancient graves. Known to archaeologists as Cahokia, the city once stood near modern-day St. Louis, in a swath of Mississippi River floodplain known as American Bottom. At its peak 900 years ago, it was the metropole of a sprawling civilization whose social, economic, and religious influence reached from the Great Lakes to the Gulf of Mexico. The cultural dynamics of such a large, complex culture has posed many questions for archaeologists, like what the relationship was like between Cahokia’s urban core and its outlying communities. 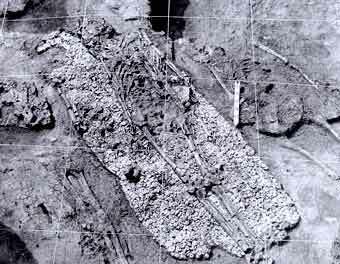 And then there are the city’s mass graves: Dozens of burial pits have been discovered in and around Cahokia, some featuring scores of bodies neatly arranged in rows, others bearing only a few, richly ornamented remains. At least one interment has been found to contain the remains of more than 50 people, mostly young women, the apparent victims of ritual sacrifice. To better understand this culture, Philip Slater, a Ph.D. candidate at the University of Illinois, and his colleagues set out to study the chemistry of Cahokia’s dead, with a view to determining where they came from. “Our primary research objective was to investigate the degree to which occupants of Cahokia were from regions outside the American Bottom — that is, migrated to Cahokia from somewhere else,” Slater said in an interview. 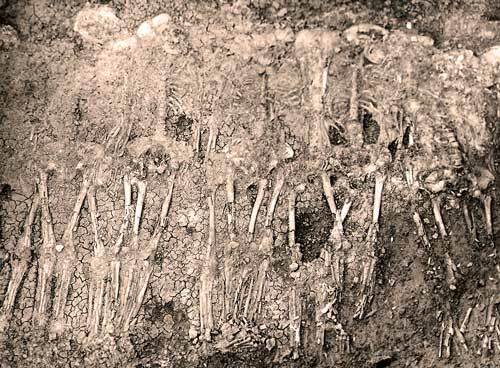 The evidence Slater’s team turned to was human teeth — found in graves throughout Greater Cahokia, from commonplace burials of people who died naturally, to some of the more unusual mass graves from a burial mound known as Mound 72. By analyzing these teeth, the researchers were able to glean where people buried throughout the city had been born, grown up, and spent their adult lives. Slater’s team accomplished this using a method known as strontium isotope analysis. The element strontium occurs naturally in soil, as well as plant and animal tissue, with different variations, or isotopes, showing up in ratios that are unique to every region, shaped by the chemistry of the local landscape. When people eat plants — or animals that ate plants — that region’s signature levels of strontium become stored in their teeth and bones. What’s more, because different teeth form at different ages, scientists can use them to effectively map a person’s whereabouts through much of his or her early life. Armed with this technique, Slater’s team studied 133 teeth from 87 people, found in 13 different burial contexts throughout American Bottom. The results showed that 38 of the teeth, about 29 percent, had strontium ratios that were outside the local range, indicating that those people had been born and raised elsewhere and migrated to Cahokia as adults. “The most significant implication of our findings is that Cahokia’s population was derived from multiple locations within and outside the American Bottom,” Slater said. Moreover, this diversity was represented in the ancient city’s mass graves, though with some twists. Among the samples from the mass burials in Mound 72, for instance, about 21 percent — 7 of the 33 individuals analyzed — turned out to be immigrants, slightly less than in the rest of the population tested. There, all but 2 of the 17 victims sampled turned out to be local Cahokians. “The tight clustering of local strontium ratios for [that grave] was somewhat unexpected,” Slater said. The significance of finding a majority of local Cahokians in the city’s mass graves was “a question that we are still grappling with ourselves,” he noted. “The fact that non-local and local individuals, and males and females to a similar extent, co-occur in most contexts suggests that they were an integrated part of the community,” Slater said. In this case, the woman’s earliest teeth — the ones she formed in infancy — were found to have strontium levels consistent with Cahokia’s local environment. But her adult teeth show that she had spent her later years elsewhere, before being buried back in her native land. “A possible scenario that could account for this would be this individual being born at Cahokia — or her mother was from Cahokia — but she herself was raised outside of the American Bottom in a region characterized by different strontium ratios, and then returned in later adolescence or adulthood,” Slater said. “Establishing, or reaffirming, ties between distant communities through marriage is a possibility,” he added. But Slater and his team stress that the aim of the study was not to speculate on the demographics of Cahokia’s mass graves — whether they contained sacrificial victims or local elites. Instead it was to better understand the population dynamics of one of North America’s most intriguing cities. “It is somewhat premature for us to comment on the nature of the elite/sacrificial nature of the population buried in Mound 72,” he said. For now, there are plenty of implications to consider from Cahokia’s newly found, and unexpected diversity. The fact that this influential settlement could have been home to such a large and diverse immigrant population will change our understanding of Cahokian society, Slater said. Slater and his colleagues report their findings in the Journal of Archaeological Science. 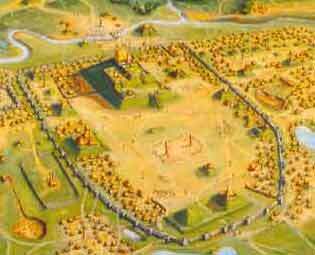 I’m working on writing a novel involving Cahokia and I’ve wondered if the cultural diversity represented in the city could be explained by rapid conquest of neighboring tribes, and assimilating hunter-gatherers into the new corn growing, mound building culture. The Iroquois did this when they conquered the Huron and Neutrals, and when Jesuit missionaries found their former parishioners and questioned them as to why they didn’t try to escape, the captives replied that they were Iroquois now. Something similar might have happened in the American Bottom. In Cahokia symbols of violence seem to have a honored place in their art. I’m thinking of the conquering warrior figurine showing a cahokian king or chief smiting an enemy with a club while forcing his head between his legs. There is no way this statue doesn’t commemorate cahokian military victory over some enemy, whose people were likely brought home for adoption into the new city state. My curiosity, run DNA tests on the bones from other tribes in the western continent to find a connection to chahokia .